SANAA — An Arab coalition air raid has hit a Yemeni hospital, killing at least 11 people and injuring more than 19, just 48 hours after strikes that killed children, Doctors Without Borders (MSF) said. MSF said on Monday a blast "partially destroyed" a hospital at Abs, located in the rebel-held province of Hajja, in the fourth attack on one of its facilities in less than a year. The United States and Amnesty International separately condemned the attack. Nine people were killed in the explosion, including one MSF staff member, while two more patients died while being transferred to another clinic. 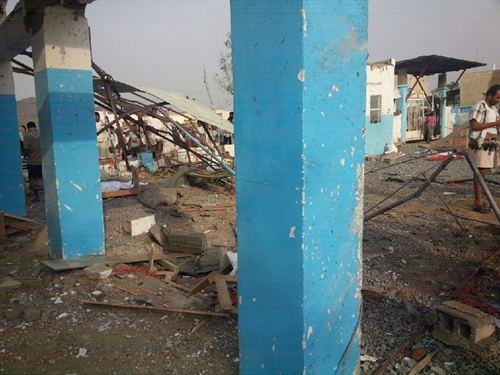 "Once again, a fully functional hospital full of patients and MSF national and international staff members, was bombed in a war that has shown no respect for medical facilities or patients," Teresa Sancristoval, of MSF’s Emergency Unit in Yemen, said in a statement. The GPS coordinates of the hospital "were repeatedly shared with all parties to the conflict, including the Saudi-led coalition, and its location was well-known," the statement added. The coalition has been battling Iran-backed rebels since March 2015 in support of Yemen’s government, after the insurgents seized Sanaa before moving into other parts of the country. Earlier this month, the coalition acknowledged "shortcomings" in two out of eight cases it has investigated of UN-condemned air strikes on civilian targets in Yemen. On Monday, it promised to probe another attack that MSF said killed 10 children over the weekend at a school in the rebel-held northern province of Saada. Sancristoval said that nothing "seems to be done to make parties involved in the conflict in Yemen respect medical staff and patients. "Without action, these public gestures are meaningless for today’s victims. Either intentional or a result of a negligence, this is unacceptable." Residents in Abs said coalition jets, which have been striking rebel military targets in the town for several days, hit the hospital and caused casualties. Rebel sources said the coalition struck a first-aid building beside the facility. One of the fatalities was an MSF electrician, while a doctor and a nurse who were both severely injured also worked for the charity, Sancristoval said by phone from Barcelona, Spain. "It’s a rural hospital which was full when the raid occurred, although it is difficult to estimate how many," she said. "The hospital was partially destroyed. We can’t work in it without major repairs." Abs is adjacent to the town of Harad, on the border with Saudi Arabia, and from where rebels have repeatedly shelled areas on the kingdom’s side of the frontier, causing both civilian and military deaths. A border guard corporal became the latest Saudi casualty Monday, the interior ministry said in Riyadh. Harad itself is seeing fierce fighting and is frequently a target of heavy coalition air strikes. Pro-government military sources, who are fighting alongside coalition forces in Harad, said military vehicles had taken rebel casualties to the Abs hospital before Monday’s air strikes. In Washington, the State Department said it was "deeply concerned by a reported airstrike" and called on "all parties to cease hostilities immediately," but did not specifically point to the Saudi-led coalition. London-based watchdog Amnesty International described the bombardment as "a deplorable act that... appears to be the latest in a string of unlawful attacks targeting hospitals, highlighting an alarming pattern of disregard for civilian life." The raid comes less than 48 hours after MSF accused the coalition of killing 10 children in Saturday’s strikes on a Koranic school in Saada. The coalition denied targeting a school, saying instead that it bombed a camp where rebels train underage soldiers. UN chief Ban Ki-moon condemned that attack and called for a swift investigation. "The secretary general notes with dismay that civilians, including children, continue to bear the brunt of increased fighting and military operations in Yemen," a UN statement said. Hours later, a 14-member investigative team made up of several coalition states and Yemen, promised to conduct an "independent" probe into the allegations. The team has already investigated claims of attacks on a residential area, hospitals, markets, a wedding and World Food Programme (WFP) aid trucks. It found the coalition guilty of "mistakenly" hitting a residential compound and an MSF-run hospital, but accused the rebels of having used the hospital as a hideout. The coalition had announced earlier it would allow humanitarian flights into Sanaa’s international airport from Monday, after a closure of several days as hostilities flared around the rebel-held capital. It had been closed since last Tuesday, when the coalition resumed air strikes around Sanaa following the breakdown of UN-brokered peace talks between the Yemeni government and rebels.